Media captionWATCH: Are drones the answer to providing high-speed broadband access to rural communities? 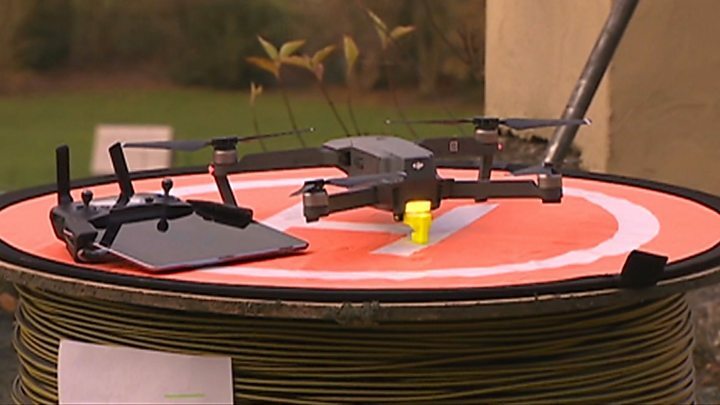 A drone has helped bring superfast broadband services to an isolated Welsh village. Cable company Openreach used the drone to avoid having to lay cable across "challenging" terrain that included woods, a river and steep hills. The drone was flown across a section of forest near Pontfadog, Wrexham, to help sling wires between telegraph poles. The community's 20 homes now have access to ultrafast broadband that can run at speeds of up to 1Gbps. "It's a bit different to connecting an apartment block in London, that's for sure," said Openreach chief engineer Andy Whale. "If we tried running the cable through woods it was also very likely we'd get it caught up in branches and other natural obstructions, so we figured the best option was to fly it in over the top of the tree canopy and then lift it up to make sure it was clear of the tree line." The small drone was not powerful enough to lift the heavy fibre cable so instead it was used to string a 100m (328ft) length of high-strength fishing line between two points above the trees. The fishing line was attached to a "draw rope" secured to the fibre-optic cable, which was then pulled along the route the drone had forged. The cabling job had been all but done in an hour, said Mr Whale. Retired teacher Chris Devismes said: "It has made a world of difference to us. "I live here with my two teenage sons and they're often online - watching films, streaming music or Skyping their friends. "When all three of us were online at the same time, it could often be a struggle and things would start to buffer and freeze." Video Drones to deliver rural broadband... huh?